The new generation PIP6-11 is based around the long-term available Z530P Intel Atom CPU. With this processor and chipset, we designed an embedded system that will operate smooth without being on its limits even at -40°C up to +75°C, and without derating, throttling, need of a fan or openings. On-board integrated are features like 5 GigE ports, USB, 2 serial ports, and 7 USB ports. Next to the outstanding extreme low power consumption is the versatility (expansions and housing concepts). The PIP 6-11 board has also a complete set of standard PC features (USB 2.0, GigE, DVI...), as well as special features like a reverse polarity protected 8-36 VDC input power and load dump protection. 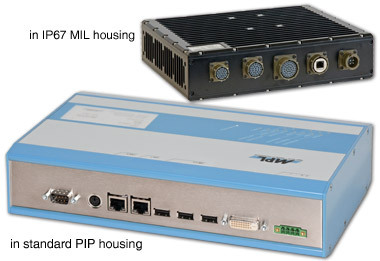 GPS, WLAN, Fieldbuses, and UPS modules can easily be integrated. Further expansions can be done over the PCI-104, PCI, and PMC I/F. These Features make the PIP6-11 to the ideal solution for applications where a low power consumption embedded PC is required. The unique design allows to use the system in any application, regardless how rugged the environment might be. For deployment in harsh environments, the PIP6-11 can be ordered in an extended temperature version. Every system needs to pass various tests in a environmental chamber to prove that it will perform flawless over the temperature range indicated.